At the height of the Red Scare, it was important for the U.S. government to indoctrinate children against the evils of Communism. How to do such a thing? Through an incredibly boring and stilted film made by Warner Bros. originally titled Freedom And You, before it was ultimately renamed Red Nightmare. The film was financed by the Department Of Defense in 1962 and would ultimately be shown in classrooms to bored and disaffected teens across the nation, who would quietly yearn for the grand freakout in store for the country in just six short years. But how to communicate to the youth about the dangers of commie living? 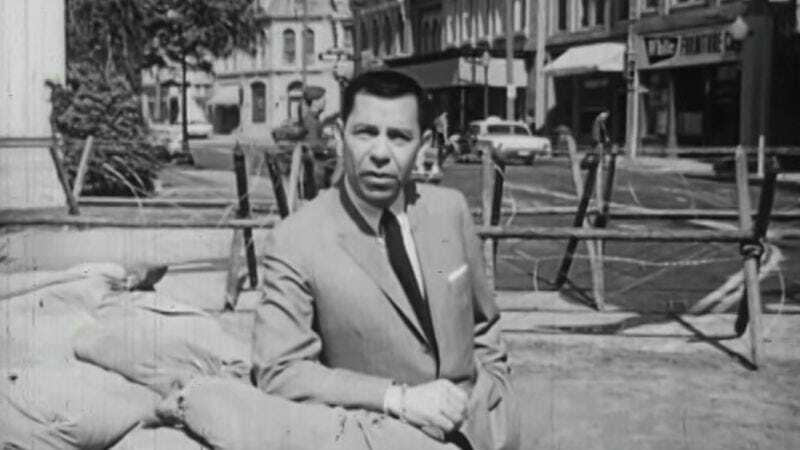 Enroll that teenage heartthrob Jack Webb (Dragnet) to introduce and narrate the film. Sure, Dragnet was popular when it ended in 1959 and this is three years later, but maybe that sense of authority will scare these kids straight. Other TV stars fill out the rest of the cast, including Maverick’s Jack Kelly. But what is the film about? Remember that ill-fated opening segment that John Landis directed in The Twilight Zone movie? Or how about “A Case Of Spring Fever” short from Mystery Science Theater 3000 starring Coily The Spring Sprite? Basically the same thing where a man dreams of a dystopian world different from the one he knows and learns to appreciate everything he took for granted. One interesting bit is that the film opens with a scene that might be out of The Americans: Jack Webb introduces the audience to a fake American town that is located deep behind the Iron Curtain where sleeper agents and other spies learn how to infiltrate regular life in this pretend slice of Americana. Then it transitions to the Donovan household, with a bit of casual racism against American Indians, before centering on Jerry (Kelly), who takes for granted all of the freedoms afforded him away from the commissar and secret police. It’s interesting to think about how many people, especially impressionable teens, were exposed to this. It’s not that boring of a movie, and is a nice artifact of the time when the U.S. government was competing for the hearts and minds of younger people to stem the supposedly ever encroaching tide of communism. So when older people bristle at “socialist” policies put forth by various candidates, perhaps it all comes back to this stilted piece of propaganda they saw in a classroom, warning them just how unfair life would be under communist rule.